For anyone making Thanksgiving dinner next Thursday, this weekend calls for a serious grocery shopping excursion. It can be a bit daunting making sure you get everything for all those dishes. To help avoid the need for a “honey would you” last-minute shopping trip, here are some tips to help make it a success. 1) Make a list. It blows my mind that some people go to the grocery store for a week’s worth of shopping without a list. 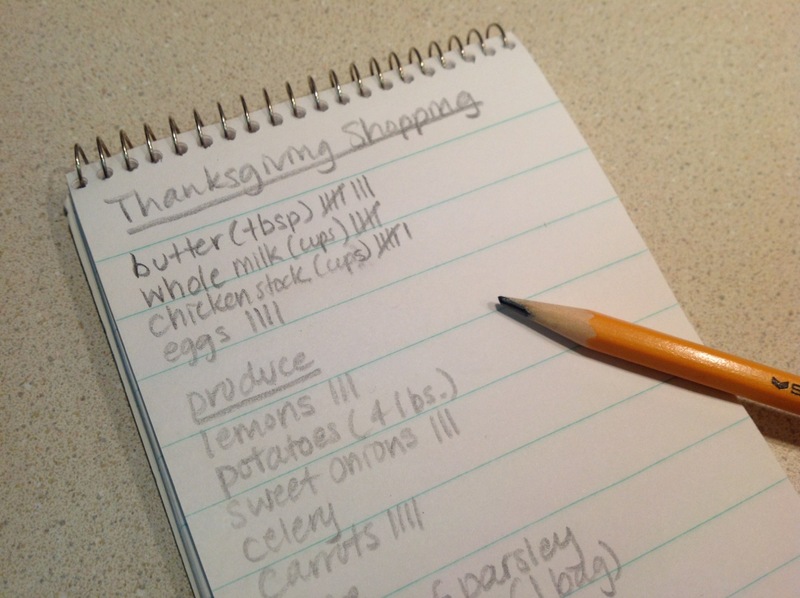 Maybe that works on a normal week, but for making a Thanksgiving dinner, a list is an essential organizing tool. It will help ensure you get everything you need and, if you organize it by type of food (i.e. produce, dairy, meats, dried goods, etc. ), it will help you get out of the store faster, which is definitely a plus on this busy shopping weekend. 2) Track multi-recipe ingredients separately. This is sort of a subpoint of point #1. As you go through your recipes to make your grocery list, keep track of items you’ll need for multiple recipes to make sure you get enough of them. I’m thinking of things like butter, chicken stock, milk and eggs. A few tablespoons here a few cups there can add up, sometimes more than you think. And unlike herbs, these are essential ingredients that are difficult to effectively substitute. I put them at the top of my list and make tick marks for a standard measure of each as I go through each recipe (tablespoons of butter, cups of stock and milk and individual eggs). 3) Buy fresh herbs. Your dishes will thank you for it. Fresh sage, rosemary, chives and flat-leaf parsley will make your dishes sing. And sprinkle a little on top for presentation points. If buying all fresh herbs when you have bottles of dried ones on hand feels like a waste, consider which herbs still perform decently when dried and which really should be fresh to impart the right taste. Oregano and thyme are decent in their dried form; dried parsley, however, bears no resemblance to the actual taste of parsley. 4) Weigh ingredient quality vs. cost. How do you effectively weigh cost and quality when given the choice between store, name and specialty brands? If you have the budget to splurge on some things but not others, do it strategically. Think about how ingredients will impact taste. The flavor of butter in the pie crust will be more prominent than butter used to sauté aromatic vegetables for stuffing, so use higher quality butter in the desserts and the store brand for sautéing. 5) Don’t buy breadcrumbs, make your own. Sure, you can buy those little dried out cubes in a plastic bag, but haven’t you noticed that they are pretty flavorless? Instead, get a good loaf of sourdough or rustic peasant bread, cube it yourself and dry it out in low-temperature oven. The more flavorful bread will add flavor to the stuffing. 6) Buy the right turkey. Some turkeys are now sold already injected with saline, so if you’re planning to brine a turkey, don’t get one of these, since brining a so-called “self basting” turkey could make it too salty. If you buy a fresh turkey, don’t buy it too far in advance, since it could spoil. 7) Visit the meat counter. A lot of meat comes pre-packaged these days, but the offerings at the meat counter will be fresher and thus tastier. I recognize that reporter's notebook! A very special reporter gave it to me.